In June of 1812, just 29 years after America’s first war of independence, the U.S. Congress and President James Madison declared its second war against Great Britain. Great Britain had been humiliating Americans by attacking their merchant ships, killing American sailors, and forcing former English sailors into action in the British Navy during its war against Napoléon. Even more damaging was England’s arming and inciting American Indians to attack settlers on the frontier in an attempt to restrict American settlements to the Eastern seaboard colonies. Tecumseh’s Indian confederacy in the north and the Creek Indians in the south had wrecked havoc on frontier settlers for many years, armed and supported by the English, the French, and the Spanish. The War proceeded on three fronts: the Northwest, the Southwest, and the East Coast. In the Northwest, Generals William Hull and William Henry Harrison led American troops that took control of Lake Erie and defeated Tecumseh’s confederation. In the Southwest, General Andrew Jackson battled the Creek Nation in multiple battles in what is now the state of Alabama. General Jackson gained notoriety by winning the decisive Battle of Horseshoe Bend that brought revenge for the Indians’ slaughter of Americans at Fort Mims in August of 1813. Emanuel Hunter, Henry Hunter’s cousin, was with General Jackson in the campaigns against the Creek Indians, the Red Sticks, and their affiliated tribes in 1814. On the East Coast, the British were winning decisive victories and on September 24, 1814 British Major General Robert Ross captured Washington, DC and proceeded to burn the Capitol, the Senate and House chambers, the US Arsenal, the Treasury Building, the War Office, the White House, and the great bridge over the Potomac River. Despite the victories on the frontier, the nation was demoralized by the British war success in the east. In the fall of 1814, General Jackson was asked to raise another command to attack the British forces approaching New Orleans. The British had plans to capture territory and move up the Mississippi River and join with their Indian allies to surround American colonies and finish off the Americans. Again, Jackson relied primarily on frontiersmen, sharp shooters, and pioneer settlers from his native Tennessee and neighboring Kentucky territories. These rag-tag troops were mostly without uniforms and proper military gear but were very experienced with the Kentucky Long Rifle and knew how to survive on the frontier. These rugged, mostly Scots-Irish settlers had defended America’s western boundaries for two hundred years and had the skills to defend themselves and their families. One of the Tennessee Regiments was led by Colonel John Cocke and was designated the 2nd Regiment of West Tennessee Militia. Henry Hunter (1783-1876), son of Dempsey Hunter (II) (1755-1833), joined Captain Bird Nance’s company. Dempsey Hunter (II) was a brother to Jacob Hunter (I) (c. 1755-1806), namesake of the Jacob Hunter Trust. Both Dempsey (II) and Jacob (I) fought the British in America’s first war of independence just 29 years prior to the service of their sons Emmanuel and Henry in the War of 1812. Colonel Cocke’s Regiment of rag-tag frontiersmen travelled to New Orleans by a flotilla down the Cumberland and Mississippi Rivers. There were several preliminary skirmishes with the British around New Orleans, while British General Edward Pakenham began assembling his 10,000-man army just South of New Orleans. 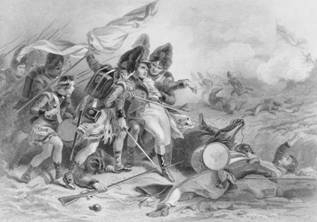 General Pakenham and his troops had successfully fought Napoléon’s army and were experienced soldiers. General Jackson had about 4,000 troops made up of around 2,500 frontiersmen and sharp shooters, 1,000 regular army troops, and a few pirates, civilians, and some slaves sent to work on Jackson’s fortifications. Jackson ordered a parapet built in an area bordered on one end by a swamp and the other by the Mississippi River. Here, the British would have to concentrate their attack without a substantial flanking potential. Henry loaded his Kentucky Long Rifle with a full charge, took aim, and fired. General Pakenham fell, mortally wounded and was drug off the battlefield where he subsequently died. Pakenham suffered a wound to his left knee where he had just been hit by flack from an artillery shell and immediately after received the fatal bullet in the chest from Henry Hunter’s rifle. After Pakenham fell, the British Army disintegrated and retreated. This was the final major battle of the War of 1812. Pauline White Mason (1911-2003), a descendant of Emanuel Hunter (Henry’s first cousin), wrote about Henry Hunter. When Henry was an old man, he lived with his nephew Jacob Hunter (II) (Emanuel’s son) on Jacob’s farm near White Ash, IL. This is where the Jacob Hunter Cemetery is located. Pauline had taken notes of several family stories primarily from Earl Weaver, an early family historian, and Pauline’s grandmother, Lucina Evaline Hunter Newton, who remembered her Great Uncle Henry Hunter. Pauline’s mother, Leona Estelle Newton White (a granddaughter of Jacob Hunter (II)), recalled that when the War of 1812 was studied at school, the teacher always made her and her brothers rise and stand before the class while the teacher told the story of the War and said that, had it not been for a relative of theirs (Uncle Henry Hunter), it was probable that America would still be a part of England. After the war, beginning in 1816, Henry and his cousin Emmanuel Hunter began bringing people from middle Tennessee to the Illinois country. He and Manuel served as guides, hunters, and protectors for several wagon trains of settlers from 1816 to 1824. Both these frontiersmen settled in Illinois and established families that remain today. Lucina Evaline Hunter Newton (1853-1933) remembered Henry Hunter as an old man when he lived in her home with her father and mother Jacob and Mary Hunter. She recalled a trick she and her sisters played on this frail, tiny, blind man. He dearly loved to be led out on the porch on a sunny day and sit with his chair tilted back on the two back legs as it leaned against the wall of the cabin. Henry Hunter died on April 13, 1876 and lies buried in the Jacob Hunter Cemetery near his cousin, and fellow War of 1812 veteran, Emmanuel Hunter; his nephew, Jacob Hunter; and several other relatives. When the Civil War came to America in the 1860s, the death and destruction was so severe that history has overlooked the importance of the War of 1812. Without the victories in that war, America would be a very different country today and its boundaries would, most likely, be contained between the Allegany Mountain Range and the eastern seaboard. Spain, England, France, and a variety of Indian populations would continue to lay claim to much of the territories west and south of the Allegany Mountains. America would not have become the great nation, as we know it today.